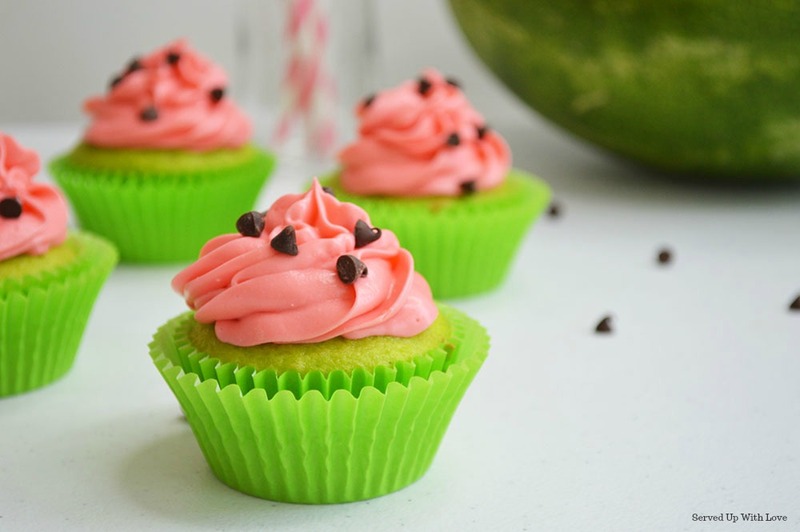 These Watermelon Cupcakes are the perfect sweet treat to celebrate all things summer. All of a sudden I looked up and it's almost August! It seems like once July gets here summer just whizzes on by. I am fall girl through and through but I still want my summer fun too! So I plan to pack as much fun into these last weeks of summer as I can. Starting with these super fun cupcakes. These are super fun for a cookout, a summer birthday party, or just because you need a sweet treat. Don't let your summer go by without making a batch or two of these cuties! Preheat your oven to 350 degrees and line a muffin tin with cupcake liners. In a large bowl, whisk together flour, baking powder, and salt, set aside. In a separate bowl, cream together butter and sugar. Add the eggs one at a time, mixing in between. Stir in vanilla. Slowly alternate adding the dry ingredients and the milk to the butter and sugar mixture, mixing well in between each addition. 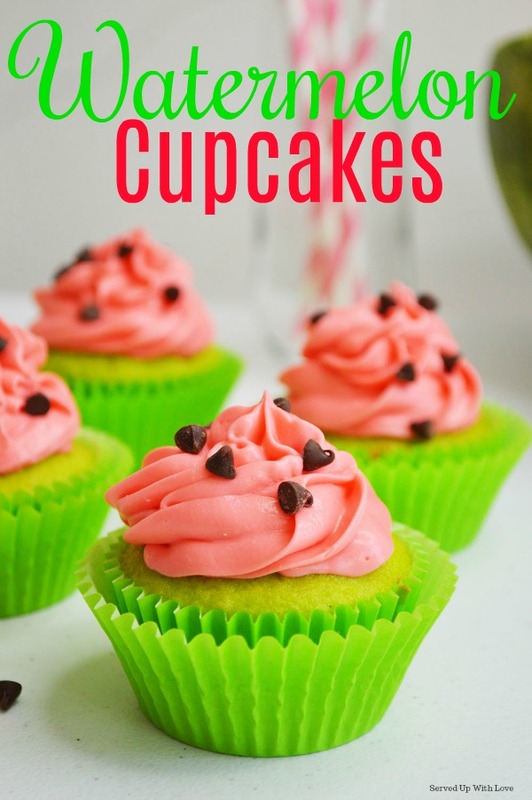 Mix in green food coloring, a few drops at a time, until incorporated into the cupcakes. Fill cupcake liners ⅔ full. Bake for 18-20 minutes. Meanwhile, in a large bowl mix together cream cheese, butter, and vanilla. 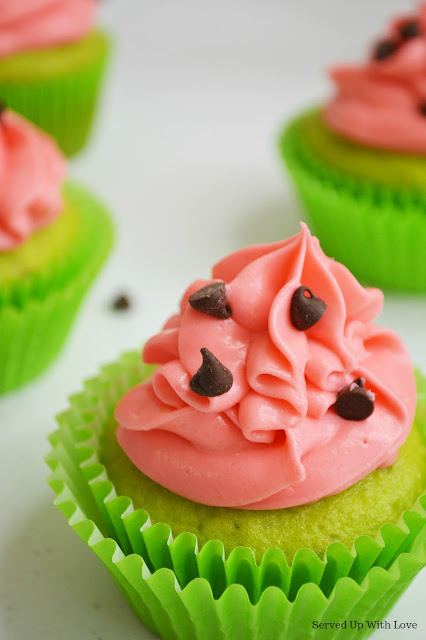 Slowly mix in powdered sugar and red food coloring until ingredients are combined and frosting is formed. Allow the cupcakes to cool completely before frosting. 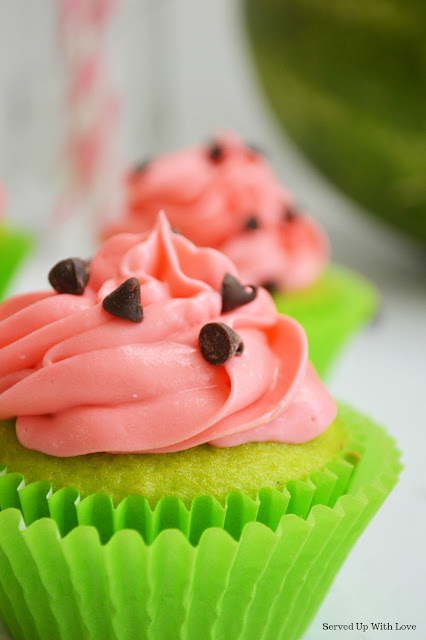 Add the frosting to your cake decorator or piping bag with an icing tip, and frost the cupcakes. Finish with miniature chocolate chips for “watermelon seeds”. Enjoy!